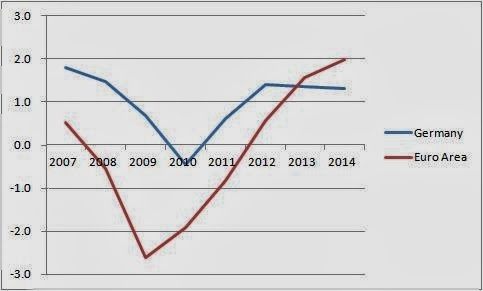 From 2000 to 2007, the periphery of the Eurozone (EZ) enjoyed a boom, while Germany did not. As a result, inflation in the periphery (and much else) of the EZ exceeded inflation in Germany by a significant and persistent amount. By 2007, this meant that Germany had become too competitive in relation to the rest of the EZ. This situation is not sustainable. The large German surplus is a symptom of that situation. Under flexible exchange rates, the German currency would have been able to appreciate against the other EZ countries, eliminating the competitive advantage. In a currency union, the only feasible outcome is for German inflation to run ahead of the rest of the EZ by a significant and persistent amount for a number of years. If the ECB was willing and able to target 2% inflation, then that would mean future German inflation significantly and persistently above 2%. That would require excess demand in Germany, to balance deficient demand in the rest of the EZ. There is really no way around this consequence of a 2% inflation target - it is just arithmetic. The problem arises because the ECB is unwilling or unable to target 2% inflation. That in theory allows Germany to attempt to force the EZ as a whole to make the required internal adjustment without inflation in Germany exceeding 2%. It can do this by a restrictive fiscal policy. This is exactly what it has done. The figure below shows the underlying primary financial balance in Germany and the whole EZ (including Germany). (Source: Oct 2013 OECD Economic Outlook.) The projected German surpluses are expected to bring down the debt to GDP ratio from 51% of GDP in 2012 to 48.5% of GDP in 2014. Other EZ countries are defenseless against this deflation, because of imposed austerity or the EZ Fiscal Compact. As a result, the path we seem to be on involves German inflation at around 2% and average EZ inflation well below 2%. This may be in Germany’s narrow national interest, but for the EZ as a whole it is much more costly, partly because of the difficulties of reducing inflation when it is close to zero. Deflation in the EZ as a whole is also costly for those outside the EZ when everyone’s interest rates are near zero (see Francesco Saraceno here). Much of the Spiegel article is about the pointlessness of blaming Germany for its success in exporting. This of course completely misses the point, but if outside criticism focuses on Germany’s current account rather than its inflation rate it is perhaps not a surprising reaction. The German current account surplus is a symptom of the underlying problem, which is a tight fiscal and monetary policy in the EZ. Whether the tight monetary policy (bringing EZ inflation below 1%) is an unforced or forced error (because interest rates are near zero) is not crucial here, except to the extent that German pressure is behind any reluctance until recently to cut interest rates. At one point, however, the article does note that criticism of Germany “holds that the Germans live and consume below their means, which is detrimental to foreign companies because there is less demand for their products in Germany.” But its response is to say that this is the fault of “countries like Greece, Italy and Spain, [who] have only themselves to blame for their troubles because they spent years living beyond their means and at the expense of their own competitiveness.” In other words, why should Germany suffer above 2% inflation because the rest of the EZ allowed themselves to become uncompetitive. Mapping macroeconomics into a morality play is almost always a mistake. So let’s just stick to the rules of how the EZ is supposed to work. The ECB is supposed to have a (‘just below’) 2% inflation target. If it was able to meet that target, Germany would have to suffer 3%+ inflation for a number of years. Now you might respond that the ECB is within its mandate if it targets 1% inflation to allow Germany to only have 2% inflation, because below 2% inflation is allowed. I think that would be stretching the mandate rather a lot (see Andrew Watt here), but even so, if that were true, why didn’t the ECB target 1% inflation from 2000 to 2007 to avoid inflation outside Germany exceeding 2%? Which brings us to one referee, which is the European Commission. I have been quite critical of the Commission in the past, and particularly of European Commissioner Olli Rehn (e.g. here). In March I also wrote a post criticising a paper co-written by Marco Buti, Director-General for Economic and Financial Affairs at the European Commission. That paper included the following quote: “In Germany, the fiscal stance is now broadly neutral, hence consistent with the call for a differentiated fiscal stance according to the budgetary space.” I was therefore slightly surprised to see Buti cast as chief German tormenter in the Spiegel article. To quote (my italics): “The chief economist of the European Commission, a native of Italy, has a tendency to blame many euro-zone ills on the nature and effects of German economic policy.” I find it tricky to reconcile Marco Buti’s March paper with this Spiegel description, but perhaps events in the intervening months (and the Commission’s own analysis) have strengthened views which could not have been expressed openly in public. (There are other constraints on the Commission, as John McHale notes here.) Whatever, I hope the Spiegel article is right, and those working for the Commission are applying all the pressure they can to change the view from Germany. It would be interesting to compare this deflationary bias in the EZ, reflecting a combination of the Fiscal Compact and the Zero Lower Bound, with Keynes’s worries about the Bretton Woods system, which helped create the IMF. Barry Eichengreen draws an analogy between current policies and the 1930s here. That is the gross figure. I was using the net. Both are projected to come down. any idea why there is such a huge difference between gross and net debt for Germany? Why would 3% inflation (or slightly higher) be suffering on Germany's part? My original had 'suffering' in quotes, so I appreciate your point. Surely the answer is for Germany to leave the Eurozone? If they want to be net exporters they cannot share a currency with any other country. That would be catastrophic for Germany: the new Deutsche Mark would appreciate overnight making German export prohibitively expensive while its industry would face competition from (what is left of) the light machinery and automotive industry of the rest of Europe. Germany used to cry foul very loud when Italy played the opposite, devaluating its currency, as the immediate effect was a loss of market in Eastern Europe to Italian products (agricultural machines in particular). They haven't forgotten that. It's not just the Germans. Apparently the Dutch central bank president voted against last week's rate cut. That is to say, the highest monetary authority of a country suffering massive post-bubble asset price deflation, low demand, anemic to negative growth and savage fiscal cuts, is actually in favour of tight monetary policy. Since this is clearly irrational, i.e. goes against both the country's interests and basic economic theory, there must be ideology in play. That means it's no use viewing policies in terms of national interests or even rational behaviour. The same is happening in Austria. They are convinced that they must meet a budget surplus in 2015. But how? The economy is weak, unemployment is rising. Hence, drastic spending cuts on essential services (health, education). But, then, GDP will fall even more, so a budget surplus will require even more drastic cuts. Was Jared Diamond who wrote a book about how societies commit suicide? Hopefully now that the German election is out of the way, the rest of the Eurozone countries with their elections up sooner will start putting political pressure on Germany to change its stance. At the moment, Merkel looks like Thatcher, a research chemist turned politician (in a very masculine party) giving lessons on household economics to regions that are not her political base - the Swabian housewives apparently are the German ideal, rather than the UK's Victorian values. EC has definitely changed their position about this in the past months. I had not, so thanks. In my MA program last year, the prof was going over some monetary models in the context of monetary unions. He said something like, "Let's assume there's a country, a_i, whose pre-union monetary policy becomes the monetary policy of the union and only shocks that affect that country will affect the central bank's policy." I don't remember a single person raising any objection to that assumption. It's just too close to the way the world actually works. I am somewhat disappointed, that SWL now seems to follow up with the classical Krugman straw man practice, to define "the view from Germany", purely based on one single article on spiegel-international, which nearly nobody in Germany even reads, until pointed to. And it merely reports, that Germany rejects the nonsense as incomprehensible, definitely not causing any "outrage", but just some bewildered astonishment. The article did seem to fairly represent a good deal of the reported reaction, including that of the government, in Germany. If you think it does not, please direct me to other sources. Unfortunately the article and the comments below are quite representative for how the German public perceives the issue. There's only a minority of German politicians and economists who criticize the export surpluses since the vast majority argues that export surpluses are good (a sign of Germany's high competiveness) and that Germany is Europe's economic engine as well as a role model for the rest. (If at all the others need to reduce Germany's export surpluses by becoming more competitive themselves i.e. "the others need to get better, not Germany worse"). Some journalists and politicians (including chancellor Merkel and president Gauck) even claimed (apparently because of government debt) that the Germans were still living beyond their means, let alone the rest of (Southern) "Europe". The fear of inflation and unemployment might explain the Germans' export fetish: The German public judges criticism against Germany's export surpluses as an assault on their economic success and as a deflection of others own failures. The average German citizen senses exports and export surpluses as pretty much the same since the media and mainstream TV pundits don't really bother explaining the difference. The German conservative view is that export surpluses are necessary to create a capital stock abroad to finance Germany's aging Population* (that's why the state has been boosting massively private insurance in the last ca. 10 years), and that otherwise Germany's industrial base will erode like in the US, UK and Southern Europe (by even more factories moving from the West to China). (*Given the huge financial losses abroad a few conservative economists are beginning to question that model). Finally, only the far left-wing party "Die Linke" as well as the far right-wing conservative party "AFD" share the analysis concerning the causes for the euro crisis (however, proposing a different solution (wage increases in Germany vs. a break up of the Eurozone)), the major parties, i.e. Conservatives and Social-Democrats as well as the Green party only differ slightly in their analysis and solutions from each other, in particular since the latter two parties feel quite uncomfortable criticizing their own policies "Agenda 2010" (wage cutting and boosting private insurance) as well challenging the mainstream opinion. this article contains the typical Anglo-saxon view that is repeated on the web over and over again. If you really want to know the German view, do an interview with some German economists. It's not just about Southern Europe vs Germany, in fact several Southern countries are irrelevant for German exports. German exports have risen because of demand for German goods outside the eurozone. Southern countries have a problem competing with low wage countries outside the eurozone, this has nothing to do with Germany. Even leaving the eurozone would hardly solve this competitiveness problem, unless Southern Europe is prepared to lower living standards to the level of Asia or Eastern Europe. It is always claimed that Germany has an export surplus thanks to a competitive advantage of the low euro exchange rate (which is not low at all compared to the dollar and many other currencies BTW). But Germany is a country with an export tradition going back decades (apart from the re-unification interval). Germany knows how to deal with a hard currency, like moderate wage increases. A hard currency also has advantages like cheaper imports of raw materials, something US economists take for granted with having the dollar as trading currency for many commodities. Than the inflation targeting: is it really possible to target 2% inflation? Even if it is possible, why would Germany give up it's competitive position compared to the rest of the world to help Southern Europe. German voters expect their government to protect German jobs and prosperity. Than the monetary expansion the anglo-saxon economists are so happy with. All it seems to do is make the rich who own the assets richer, creating bubbles in the way, with limited trickle down effects for the rest of the economy. If you thing reflating bubbles is the way to run your economy, than yes, I guess it works. But this is not the German way. The problems of the eurozone are not about the North vs the South, so focussing on Germany is pointless. The problems of the Southern countries run much deeper. Even leaving the eurozone would not fix them, at least not without taking a huge hit on living standards in those countries. And that's not someting those countries are willing to accept, so they choose to stay in the eurozone, even is this means high unemployment. Don't blame this on Germany. Just a quick reply. Canada has done quite well targeting 2% inflation. Recently it's dipped down a bit but for the last twenty odd years it's been pretty well 2%. I suspect you are spot on anonymous. I suspect though that American economists, who do not know the first thing about Germany would understand "moderate" as you use it above as an adjective rather than a transitive verb, because they do not understand how the German labour market works. Looking at Paul Krugman's table, are lower goods prices caused by macro policy contraction or (largely externally driven) energy prices? The fact is that Germany is freeloading on the rest of the Eurozone: Without a euro that is lower than a new DM would be, German exports would be much lower. Can there be any disagreement on this point based on economics and not 'morality'? We don't know this for sure, do we? You can equally claim that the South is freeloading on the German backed ECB: without being in the eurozone, their borrowing rates and inflation would be higher. The problem with inflation currently is that it's much too low. As the anonymous 07:59, since you asked back, what better describes „the view of Germany“, I felt I own you a few more words, beyond the snipe „we just ignore the Treasury and the Krugtrons“, which just explained, that there is no proper link for this. Anon 11:53 explained some of this; therefore I just add a few more strokes, corrections to the picture. I don’t think that the more educated folks here are afraid of hyper inflation, but rather the continuous type, like Italy since the 1970 – 2000, reducing the value over 30 years by a factor of 6. The accumulated German Current Account, as shown in the imbalance procedures, was neutral until 2004, no “mercantilist” hoarding intentions. What bewilders us more and more, is the general ignorance of treaties like Maastricht (no bail out, no money printing) and the stability pact, which does leave some room for limited fudging with the “structural deficit”. That it seems to become more and more clear, that some folks are intent to not only bent the rules, and add support structures like the ESM, but breaking the law. And that they do so with increasingly criminal wording (e.g. Bin Smaghi, Pritchard’s “knife to the throat of Schäuble”, a victim of a prior knife terror act). The utterings of the US to bend others fiscal policies to their interest are not new, at least since 1971, we take that like the mutual incompatible writings of G-7 communiqués, relaxed. I wondered a while how to explain the non-reaction in Germany, and the best way I can come up with, is, that if somebody asks you something deeply inappropriate like “I hope you don’t mind that I sleep with your wife”, many of us react the first time in pretending that we didn’t hear it. I’ll hope that helps a little bit better to understand the German view. Looking forward to your latest update, Simon, following the latest update from the BofE in which Carney expressed some optimism over the next few years. Unemployment down to 7% by 2015 - whew, heady stuff! And of course all the credit goes to Osborne and Cameron. Look forward to a suitably forensic post in due course. The claim by Wren Lewis, Krugman, and maybe some others, is that the eurozone needs more inflation, but that Germany doesn't want it and is preventing it. Regarding the second claim, I am sure Germany isn't alone. Neither the people of the eurozone, nor the politicians who are aware of their voters wishes are in favor of more inflation in my opinion. I even wonder about eurozone economists. Is the view expressed in this article just the view from across the channel/ocean or do eurozone economists actually agree with this view? Summary: It's not possible for every country to simultaneously export more than they import. Who is recommending that? It is quite enough if they export enough to pay for their imports. Germany says nothing else. You write, "The German current account surplus is a symptom of the underlying problem, which is a tight fiscal and monetary policy in the EZ." I reply that the EZ nations have a loose fiscal policy; that is that they have spent well above their budgets. EZ monetary policy with LTRO1, LTRO2, OMP, and now with the Low Interest Rate Promise Forever and Credit Availability Promise by Mario Draghi is loose in the extreme. Eurozone nannycrats are beginning EU fiscal rule, by exercising in policies of diktat in regional governance and schemes of debt servitude in totalitarian collectivism. The Telegraph reports The EU Uses New Budget Powers To Demand More Austerity In Italy And Spain The European Commission has exercised historic new EU powers allowing it to revise national budgets for the first time. The age of liberalism was terminated on October 23, 2013, when the bond vigilantes called the Interest Rate on the US Ten Year Note, ^TNX, higher from 2.48%. And the nail in the coffin for the paradigm of liberalism was the beginning of fiscal rule by EU Nannycrats. Now we are living in the age of authoritarianism. The German current account surplus has many causes, one of which is low unit labor cost, and another is known excellence in things exported. The German current account surplus is exporting economic deflation and economic recession to the PIGS, (Portugal, Italy, Greece, and Spain), but now also to France. The Euro, FXE, has risen from 127 on July 1, 2013 ... to 133 on November 15, 2013. A higher Euro is destroying economic production in the PIGS and now in France. The EUR/JPY stands at 133.15 on November 15, 2013, and when the currency traders call this lower as the Interest Rate on the US Ten Year Note, ^TNX, rises from 2.72 on November 15, 2013, then World Stocks, VT, Nation Investment, EFA, Global Financials, IXG, the Eurozone, EZU, and European Financials, EUFN, will tumble, with the result that there will be terrible economic deflation and economic recession.